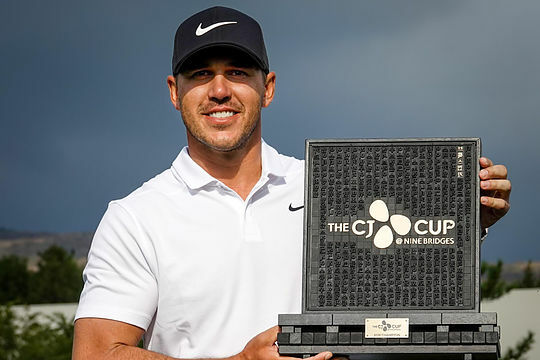 The movement at the top of the world golf rankings continues this week with PGA Tour Player Of The Year, Brooks Koepka, becoming the latest player to claim the top spot following his steam-rolling victory at the $9,500,000 CJ Cup in South Korea. Koepka leapfrogged good mate, Dustin Johnson, to move to world N0.1 with a four-stroke victory at Nine Bridges on Jeju Island in the first PGA Tour start of the new season for the 3-time major winner. “I always felt like I was in control, I felt like I was playing good and I felt like he played a great round, but I always felt like I was in control,” said Koepka. “I’m not somebody that’s going to panic if things go the wrong way, pretty sure everybody can tell that,” he said. And Koepka managed to do just that, staying one step ahead of superb finishes from both Gary Woodland (2) and Ryan Palmer (T3), who signed for final rounds of 63 and 62 respectively. It wasn’t the first time we’d seen Koepka’s almost robot-like ability to stay one step in front of his rivals when the pressure was on. The Florida-native denied a fast-finishing Tommy Fleetwood at the US Open this year and then at the PGA Championship two months later he calmly kept Tiger Woods (and Adam Scott) at bay despite the massive galleries cheering on every move by the 14-time major winner. Also, unlike many of his PGA Tour contemporaries, the 28-year-old has amassed his 12 professional victories in a disparate list of countries (USA, South Korea, Spain, Italy, Japan, Turkey and Scotland) right around the world indicating an ability to compete at any level, on any course. It was a great weekend for the Australians in the field, who came home strong across the final two rounds. Jason Day secured a share of 5th place at 12-under alongside Scott Piercy with a final round 5-under 67 while Cameron Smith carded a 3-under 69 to claim 7th place. Adam Scott will take renewed confidence into this week’s WGC-HSBC Champions tournament in China with a lightning final round 9-under 63 making up for a poor start on Thursday. Last week’s CIMB Classic winner, Marc Leishman, finished in a tie for 18th with Rod Pampling equal 41st. The WGC-HSBC Champions in Shanghai will be one of two PGA Tour starting later this week with the rest of the players fighting it out for an early season victory at the Sanderson Farms Championship in Jackson, Mississippi.